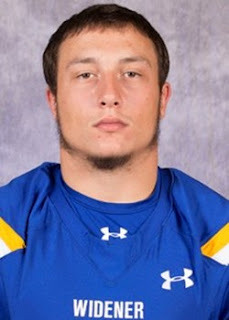 CHESTER, Pa. (Oct. 31, 2015) – Senior Robert Getz rushed for 123 yards and junior Alex Krivda factored into five touchdowns in leading the Widener University football team to a convincing 48-7 rout of Lycoming on Saturday afternoon at Leslie C. Quick Stadium. The Pride scored 38 unanswered points and recorded 11 sacks defensively to run away with the victory. Widener (5-3, MAC 5-2) led a competitive game by a 10-7 score before breaking loose with 17 straight points in the second quarter. Getz rushed for 18 yards to paydirt to make it 20-7 with 5:59 left, giving the hosts a cushion to work with. The Pride appeared to be going into the break with a comfortable 13-point lead, but a defensive stop with under two minutes remaining that was highlighted by 1.5 sacks by Stacey Sunnerville and a 61-yard punt return to the eight-yard line by Jacob Parola set up another score for the hosts. Krivda found Philip Ragona on the first play of the drive to give Widener a commanding 27-7 lead at the recess. The second half also belonged to the Pride, as the hosts kept the Warriors off the scoreboard and ended the game with 38 unanswered. Krivda threw a nine-yard touchdown pass to Ragona and rushed for a nine-yard touchdown to make it 41-7 at the end of the third. Max Kutler closed out the scoring by catching a 29-yard throw from Krivda, which was his longest completion of the day. Krivda threw for 183 yards by completing 25 of his 40 attempts. He had four touchdown passes and another touchdown run on the ground to pace the Pride offense. Ragona caught two touchdown passes, and Getz finished 123 yards on 16 attempts. Defensively, Widener was once again led by senior captain Brandon Jones and Sunnerville. Jones had three sacks, four tackles for a loss and one pass breakup, while Sunnerville registered 2.5 sacks and had six tackles. Special teams play was also solid for the Pride, as Parola returned two punts for a combined 71 yards and senior Ryan O’Hara converted two field goal attempts. Lycoming (2-6, MAC 2-5), which was held to just 126 yards of offense, saw starting quarterback Chase Whiteman throw for only 48 yards and get sacked seven times before being replaced. Blake Bowman rushed for 74 yards, while Mike Ward led the defense with 6.5 tackles and an interception. Widener will play FDU-Florham in its final regular season game at Leslie C. Quick Stadium on Saturday, Nov. 7 at 1:00 p.m. The Pride will also recognize their senior class prior to the contest.